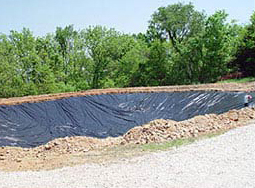 A leading manufacturer of tank liners for a large variety of industrial purposes, Fab-Seal Industrial Liners, Inc., has been designing, manufacturing, and installing flexible PVC liners for 30 years. Call 800-874-0166 now to speak to one of our knowledgeable representatives and discover how Fab-Seal Industrial Liners, Inc., can handle your PVC liner manufacturing and installation needs. Fab-Seal custom fabricates PVC liners in our factory with the art of radio frequency sealing technology. The one-piece liner saves most of the down time experienced with applied coatings and on-site fabrication. Fab-Seal produces PVC tank liners with extreme compatibility to most inorganic and corrosive fluids, and creates PVC liners with a cost-effective approach to installation. The internally fitted and mechanically held flexible PVC liners systems will save down time, installation preparation and, and the expense of premature applied coatings failure. The PVC liner available through the industry experts at Fab-Seal are resistant to water, oil, alcohols and household detergents, making them useful for a wide range of industrial uses. Chemical resistance charts are available upon request. Call 800-874-0166 today and find out how the industry professionals at Fab-Seal Industrial Liners, Inc., can handle your PVC liners manufacturing and installation needs. Or click the Request a Quote button to the right and one of our knowledgeable representatives will respond to your inquiry shortly. Have a question about PVC Liners?